Cast your mind back to 2002. Porsche, that bastion of proper sports cars, announced that it was building an SUV and its legions of fans revolted. That such a pure manufacturer, a company that built its reputation of driver enjoyment, could build a hi-rise people-shifter was unthinkable. It was the end of Porsche. Except of course it wasn’t. 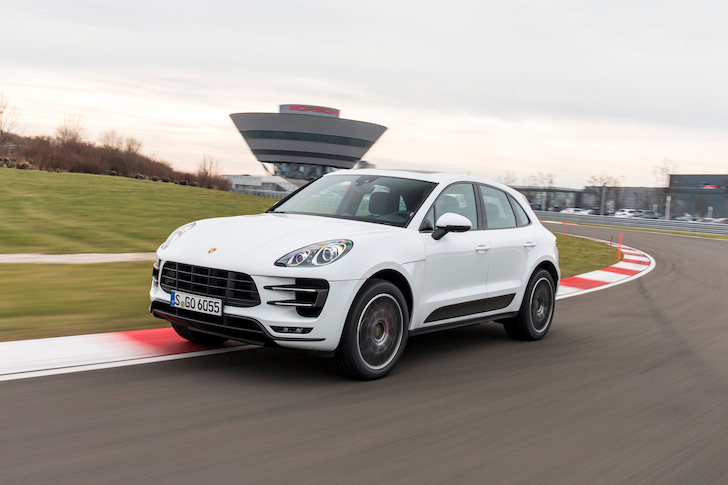 The Cayenne was a massive success; in 2012 it sold more units than the Panamera, 911, Cayman and Boxster put together. There was, and continues to be, a very large market for luxury sporty SUVs. So in many ways it’s surprising that Porsche has taken so long to bring out another model. The new Macan is a smaller machine, a compact SUV that takes the fight to the BMW X3, Audi Q5, Range Rover Evoque and, when it eventually enters production, Jaguar’s C-X17. With developing markets like Russia, China and of course the Middle East clamouring for more SUVs, this is another important car. And Porsche knows it. At the international launch of the event in Leipzig, Germany, executives flat out said they expect it to rival the Cayenne in terms of sales. Almost $700 million has been invested in a new manufacturing facility, and 1500 new jobs created to build 50,000 Macans each year. While this assault on a new and increasing market is going on, Porsche is adamant that it will remain a purveyor of fine sports cars. Which means it needs to keep its customers happy, and infuse the Macan with a sense of the not inconsiderable heritage that is so evident in the likes of the 911. Early signs during the pre-drive press conference are positive. We’re at Porsche’s Leipzig facility, which houses not only the factory where Macans are being built, but also a test track and a small selection of vehicles from the Porsche Museum. 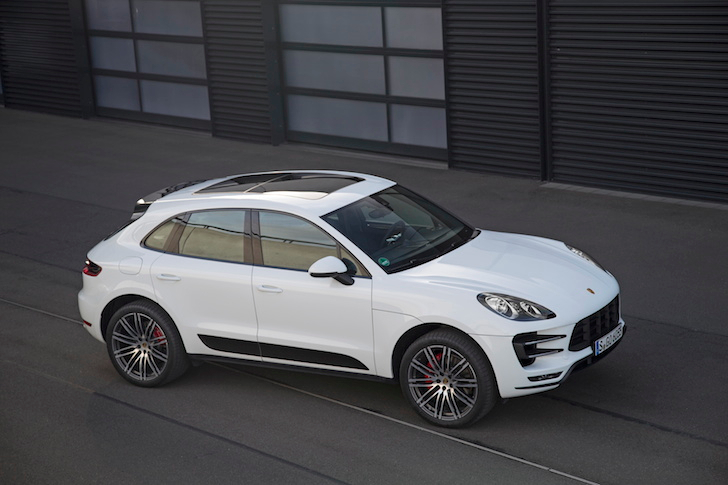 The SUV produce line director points towards other four-wheel drive Porsches of the past as inspiration for the Macan’s development – the 953 Paris-Dakar rally car, the 959 and the all-wheel drive 964. But underneath the new body shape, theMacan shares a base with the competent but uninspiring Audi Q5. How sporty can this new Porsche really be? In fairness, more than two-thirds of components in the Macan are all new or heavily modified from the Audi. 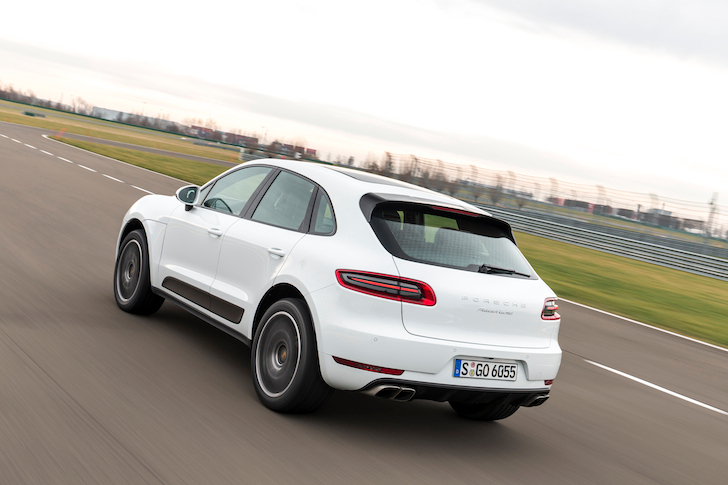 The result is a car that certainly owes a few nods to the Cayenne in terms of its look, but has enough distinctive features to stand on its own. For my money, the front end is a bit too busy, and it looks like the back is missing a feature with a large blank space below the lights. However, the 3D effect of the rear lamps is cool, and with a sleek profile the overall effect is on the snazzy side of tolerable. There are three versions of the Macan available at launch. The diesel version is not coming to the Middle East, so we’ll say no more about it. The ‘entry level’ version therefore is the Macan S, which boasts a 3-litre biturbo V6 producing 335bhp. The format of the launch event means we start with a session on track. I’m immediately curious, as most SUVs are immediately shown up to be useless in this setting. So settling into the cabin is a curious experience. It certainly feels like aPorsche. The interior is virtually identikit to other models in the range – the key twists to the left of the wheel, there’s the familiar three-gauge layout on the instrument binnacle with the tacho looming large in the centre. The rising centre console is virtually identical to that in the Panamera. Only the fact that I’m sitting higher than in a sports car gives the game away. Having said that, the seating position is comparatively much lower than the Cayenne. I’ll be chasing a 911 on track, nailing a handful of laps before I come back in. It’s a short but intense introduction to theMacan. Starting the engine produces little in the way of aural excitement – a muted hum replaces any of the flat six sounds we’re more used to hearing. Within just a few corners, I’m impressed. The 911 isn’t hanging around, and I’m having to push the S hard to keep up. My natural expectations of SUVs mean I’m very cautious into the bends, expecting roll and gobs of understeer, but so far they haven’t materialised. This slow in, fast out technique through the bends means I’m getting hard on the throttle, and Porsche’s brand of driver-orientated tech starts to shine through. 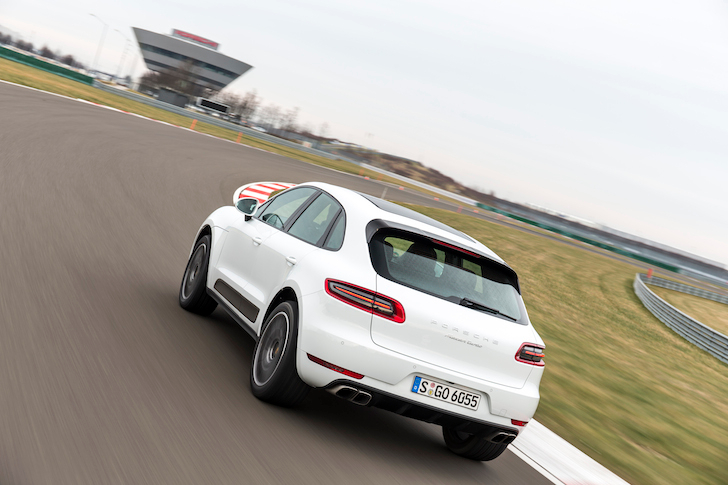 The Macan is equipped with Porsche Traction Management, the same system found on the 911 Carrera 4, which means power is delivered to the road in a different way to many soft roaders. Most are front wheel drive and bring the rears into play only when traction is lost; that way lies understeer city. This set up means the power is predominantly at the rear, which means when the gas pedal is mashed there’s hint of twitch at the back. Just a hint, mind; plenty of clever anti-slip tech, differentials, multi-plate clutches and torque vectoring systems work together to ensure the power is put where it needs to be, and the Macan hauls itself with composure towards the next section of track. The lack of body roll is seriously impressive. There’s lurch when stamping on the brakes, which in the S model are good and full of feel, but start to fade after two laps of hard usage. But it’s the quality of turn in that impresses me the most. After a couple of laps I begin to realise that the anticipated understeer simply isn’t there. I grow more bold with the front end, turning in harder, and it complies, and continues to comply until I’m hurling it in with a vigour that really shouldn’t be possible in an SUV. Even in tight, downhill, off-camber corners, it grips and goes, giving a wiggle on exit as I plant the throttle, and at speed through a long right hander it not only hangs on, but willingly tightens the line far past what I thought should be the limit. From there it’s an instant hard bang onto the brakes into a bus stop chicane, and the car feels ultra composed. The only slight let down of the S is the engine – a chassis that feels this sorted deserves a bit more grunt. The delivery of the V6 is smooth and refined, but there’s just not quite enough pull for my tastes. This is meant to be a Porsche after all. So, let’s see if the Turbo can change things. We pull into the pit lane, and I jump into the Macan Turbo that was previously tootling around behind me. This sports a larger 3.6-litre biturbo V6, which pumps out 395bhp. And immediately, the difference is obvious. Even with all the Sport Chrono settings on normal, the response is sharper, the thrust forward more positive and the speeds greater, comparable to the way a Cayman feels at full acceleration. And with Sport Plus enabled, it’s genuinely fun to drive. The 911 in front of me is giving it some, wiggling around out of the bends, and I’m having little trouble keeping on his tail, keeping on edge with the rears driving the action. Meanwhile the S behind me is dropping further back. Both cars are equipped with Porsche’s excellent seven-speed PDK gearbox, which is as good as it’s always been – fast and smooth via the gear-mounted paddles. This particular Turbo has the optional carbon ceramic brakes fitted, which unlike the standard discs on the S hold up brilliantly to track abuse. As we pull back into the pits, I reflect that I’ve just laughed out loud while driving a compact SUV. On a track. What madness is this? Realistically, very few owners are going to take a Macan on track, but it’s reassuring to know that if they do, the Turbo will keep them happy. All this is very well, but the Macan’s main customers will expect it fulfil the more traditional roles of an SUV as well. I only get to take the Turbo on-road, and it’s not the most inspiring stretch to drive, but it gives an impression of what to expect. The ride is more than acceptable – the sporty bias means it’s not floaty like some of its rivals, and you can feel the texture of the road under you, but it’s perfectly comfortable, as is the seat – enclosed enough to stop you flying into the passenger’s lap during hard cornering, but loose enough not to feel completely cocooned. There is more wind noise than I’d like or expect, whirling and whistling around the front of the car, and there’s not enough engine and exhaust sound for my personal tastes either. For my money, Porsche should have beefed up the performance sounds into the cabin while simultaneously improving insulation against unwanted aural clutter. But that’s a small quibble. 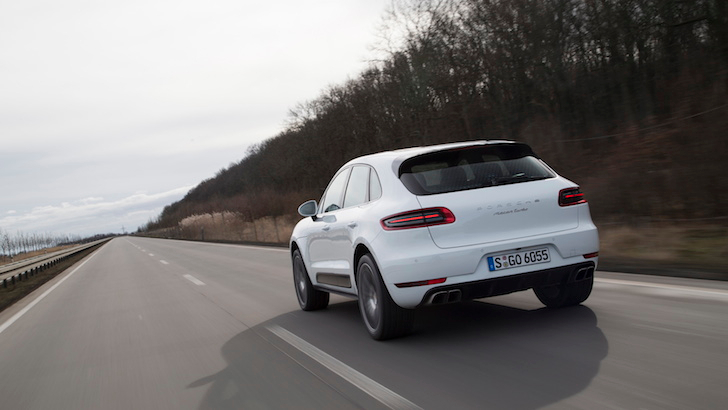 The Macan is perfect for run-of-the-mill pootling on motorways and back roads – comfortable, luxurious inside, with all the modern gadgets you’d want or expect. And the Burmester stereo is excellent. Traffic and the local topography meant there weren’t any exciting stretches to attack, but having experienced it on track I’ll put money on it being more than capable. 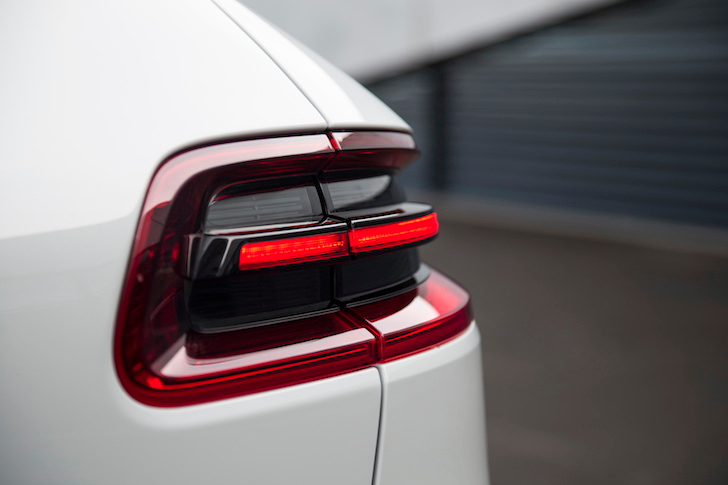 As an added bonus, the Macan will handle light off-roading too. I’m not sure it’ll be able to compete with the Evoque on that front, due to the lack of a Terrain Response system, but after a brief blast around Porsche’s off-road facility – a disuse Soviet tank proving ground – I can confirm that it’ll drag you up steep hills, take you safely down them, and articulate over decent sized rocks well. For light dune bashing, it shouldn’t struggle too much. This has been a taster of the Macan, and for the full verdict I’d want to get it back on home ground and spend a few days really getting to know it. But based on this single day, I’m very impressed. Porsche has managed to produce a compact SUV that fulfils the school-run, trip-to-the-shops and commuting needs of most customers, but that also has the dynamic capability that purists demand and that cars bearing the Stuttgart badge deserve. The S feels slightly underpowered to really excite when pushed hard, although its chassis impresses. 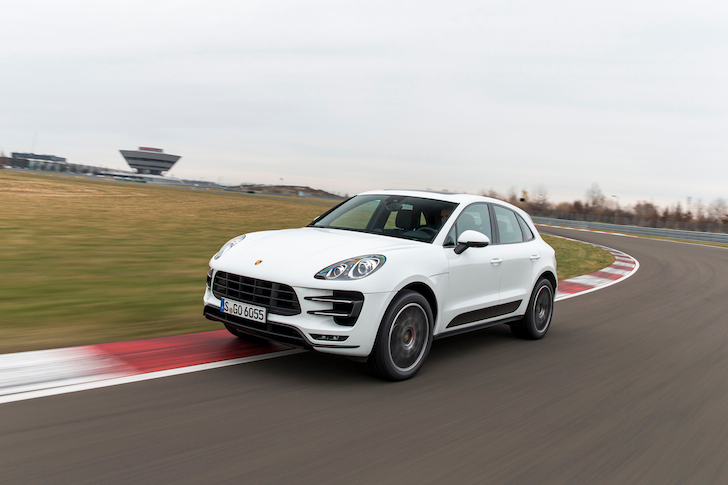 The Turbo brings the grunt to make the Macan properly fun and involving. I like it far more than I ever expected to.